Neither of my dining pals eats raw tuna… so I had to down three orders of that and in exchange, I passed on the Pulled Pork Springroll and the Grilled Chorizo… but toughed it out with the stuffed cherry pepper (shhh… don’t tell anyone I ate pork). Starting with the top of the list with the stuffed cherry pepper… the pepper wasn’t as hot as I expected (good thing) and the filling was very savory, bordering on tangy, from the gorgonzola (which was overpowering). While I liked it, I didn’t love it and could barely taste the chorizo and wasn’t able to detect any seafood. The salmon was nice… I really enjoyed it and especially liked it paired with the chipotle cream cheese. The orange, tamarind and onion relish was sweet, tangy and tasted great with the sweet potato chip. The smoked mussel was divine… salty, tart, smokey and fresh. The tuna was good (and I’m a HUGE tuna ceviche fan), but had a little too much spice for me. I liked it, but my mouth was numb the rest of the evening. Perhaps this was because I had three servings of it?! The popcorn shrimp were sweet, crunchy and intensely seasoned… a real pick-me-up. 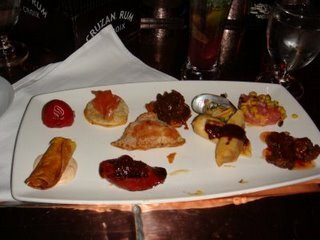 The jalapeno empanada was great… not too much heat and just enough savory goodness. Last, but not least, the chicken taquito was by far my absolute favorite of the evening. From the crispy exterior to the smokey, savory and spicy interior, this little package of goodness was too small and I basically devoured all of the aioli as well. All these dishes packed a punch… squeezing as much flavor and intensity into as tiny a package as possible. If you are a person who enjoys bland food, then these tapas are not for you; however, if you are a foodie that drools over food that douses your palate with the intensity of a kicking and screaming banshee, then make your way over to Masa. After Masa, we decided to walk a block down the street for a sweet ending at Picco. 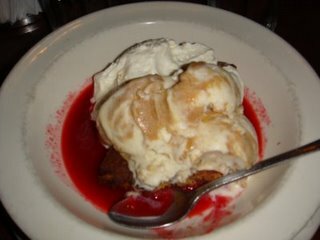 I had the Toasted Gingerbread, served warm, topped with homemade ice cream (I chose Peanut Butter Swirl) and topped with raspberry sauce and whipped cream ($7). Another blogger friend got the same thing, with a different ice cream and the third blogger in our party got the Affagado, ice cream drowned in espresso with hot fudge and whipped cream ($6.5). I shouldn’t have… but I ate the entire thing. I think we all did. The home made ice cream was so fricken good! And even though it sounded like a weird combo — gingerbread, peanut butter and raspberry — it SO worked! Of course, you can order any type of ice cream with your dessert, but I recommend the PB. All-in-all, a very inexpensive evening for a bunch of hungry (and poor) bloggers. Know of any other deals and steals? Let me know! Also, to read what my fellow bloggers though… visit Cave Cibum or Calamity Shazaam in the Kitchen for their complete reviews.